CALL Call / Email Owner FOR RATES AND DATES. Make your reservation now! Don't Miss Out!! Bask in the luxury of oceanfront living for your next vacation in the best location at the beach! Located in a quiet upscale beachfront neighborhood. Enjoy the many amenities this luxury home has to offer including privacy. 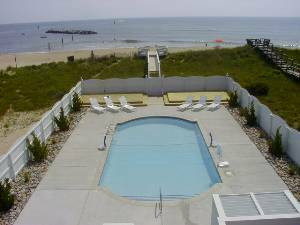 Enjoy a quiet peaceful vacation in this nicely maintained beachfront rental home and also enjoy close by lively entertainment at the VA Beach resort district boardwalk. The boardwalk offers nightly family entertainment and plenty of restaurants to sample the local flare. The quiet neighborhood offers relaxing days and evenings. Enjoy beach combing/shell hunting, swimming, surfing, fishing, sunning, walking, biking and more right in the backyard or neighborhood. 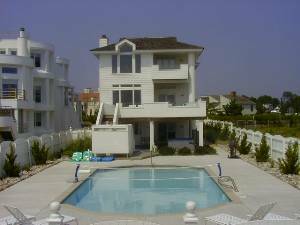 If you have to have a pool, this home is the only large luxury beachfront rental home in VA Beach that offers just that. Outdoor hot/cold showers along sid the pool. 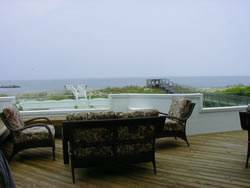 Come enjoy our exquisite oceanfront home and take home lots of wonderful memories at any time of the year! Off-Season weeks availabale at reduced rates! Don't Miss This Exquisite Home on the Virginia Beach Oceanfront. CALL us at Call / Email Owner . Professional universal weight equipment, professional grade massage chair, professional billiards, adult bikes, beach and pool toys, beach chairs, gourmet kitchen, wet bar, baby/toddler highchair, crib and swing. Golf, museums, theme parks, historical sites. This oceanfront home was the perfect place for our family vacation. Three generations stayed, played, laughed and enjoyed the home, scenery and peacefulness of this lovely home. We have made plans to return. Thank you for sharing your beach home. Deposit: $1,000.00 Refundable Security Deposit per reservation. Call 757 635 3750 for more details. Cancellations and Refunds: Contact us for details. Other Fees: Processing fee of $85.00 per week reservation. Cleaning fee only if cleaning is required beyond standard service.